Buzzword Bingo is a fun game to play during meetings at work (but don't blame anyone but yourself if you get fired). Each member of the team takes one card into the meeting, and discretely ticks whatever words on his card that your boss says during the meeting. Whenever a player achieves the agreed upon bingo (such as a line of 5, or two overlapping lines of 5), depending on how brave he is, and whether he wishes to keep his job, he can either stand up and yell "BINGO!" or give a more subtle pre-agreed signal to the other players. Perhaps the most famous (infamous?) game of Buzzword Bingo was played at MIT in 1996, during a speech given by the then Vice-President, Al Gore. (Really: see here). 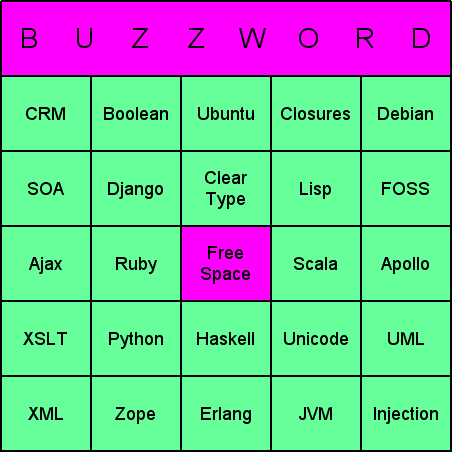 Buzzword Bingo is of course popular for those working with software and computers, but there's nothing to stop you playing the game in other industries that are full of jargon... Although, if you do work in the nuclear-power or aviation industries, perhaps it might be better to forego the game, and actually listen to the meeting. Advanced Rules: Most meetings involve a two way conversation with the boss. Skilled players, will steer the boss towards saying the right target words. In the "Advanced Rules" version, this is encouraged, but you may only claim words that you have not said yourself during the meeting. Thus the challenge becomes (1) to get your boss to say "Erlang" without saying it yourself, and (2) to survive the meeting without saying too many buzzwords and killing your chances. In this variant, you can also manoeuvre your co-workers into saying the buzzwords and reducing their chances of winning. Below is an example bingo card. (This particular example uses buzzwords common in the computer industry, so if you work in a different field, or feel that any of these buzzwords are too obscure, you'll probably want to create bingo cards with your own choice buzzwords). Below is a printable set of buzzword bingo cards (click the Print icon in the window to print). Just print and play! Instructions for producing your own custom buzzword bingo cards are below. Type your buzzwords into the field on the screen labelled Type your new item here, pressing Return/Enter on the keyboard after each one. You need to add at least 24 items, but you can add more if you want.